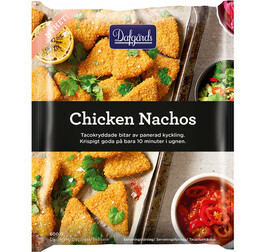 Retail packed nacho-spiced pieces of breaded chicken. Good and crispy after just 10 minutes in the oven. From frozen: Oven: 220°C for 10-12 minutes. Deep fryer: 185-190°,C for 2-3 minutes. Frying pan: Fry on medium heat in little cook,ing oil for 1-2 minutes per side. Chicken (55%), WHEAT flour, corn flakes (corn, salt, malt of BARLEY), rapeseed- and sunflower oil, salt, spices (incl. pepper, tumeric, cumin, onion, garlic) corn-/rice flour, WHEAT starch, pea-/bamboo-/citrus fiber, maltodextrin, WHEAT GLUTEN, yeast extract.